Paul Manafort's one-time banker had his Manhattan penthouse burglarized overnight, a mysterious break-in that saw a briefcase, iPad and sneakers stolen from the residence, law enforcement sources familiar with the case tell News 4. Jonathan Dienst reports. 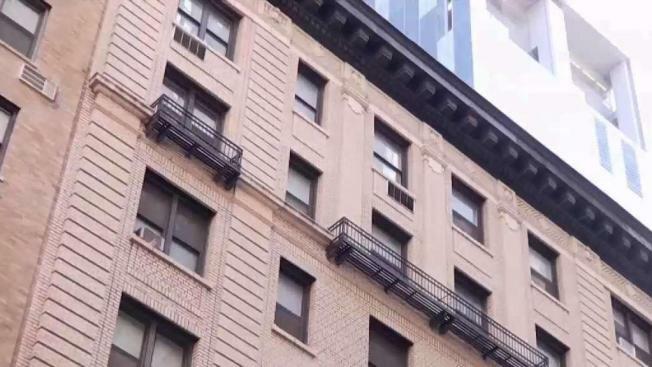 Paul Manafort's one-time banker had his Manhattan penthouse burglarized overnight, a mysterious break-in that saw a briefcase, iPad and sneakers stolen from the residence, law enforcement sources familiar with the case tell News 4. David Fallarino, dubbed Manafort's "front office banker" at Citizens Bank by the Huffington Post, told authorities he left the terrace door of his West 58th Street home open before he went to sleep Monday, the sources say. The building is nine floors, city records show. Fallarino, 38, said he heard a noise around 1:30 a.m. Tuesday and went out to find a crow bar on the terrace, the sources say. There were no apparent signs of forced entry, the sources say, but Fallarino reported his wine cabinet was open and there was a bottle of wine on the floor. The briefcase, iPad and sneakers were the only items missing; the contents of the first two were unknown. Paul Manafort's one-time banker, David Fallarino, had his Manhattan home burglarized; a briefcase, iPad and sneakers were stolen. The sources did not have any information on a possible suspect or suspects, who apparently entered from the balcony and left via the front door. Police are checking the building for potential surveillance video. Repeated attempts to reach Fallarino were unsuccessful; an assistant at Citizens Bank said he was on vacation and declined to comment. Citizens Bank also declined corporate comment, referring questions to the NYPD. Fallarino was one of three so-called key figures not called by Robert Mueller's office to testify at the trial of the ex-Trump campaign chief, who was convicted on eight felony fraud-related counts earlier this month. A mistrial was declared on 10 other counts. Two of Fallarino's assistants testified at the trial, the first public test of Mueller's investigation into alleged Russian meddling in the election, regarding emails the banker had sent and received. One of those assistants was Melinda James, a mortgage loan assistant at Citizens Bank who served as the loan assistant to Manafort when he applied for a cash-out refinance loan -- a loan that allows the owner to take the equity out as cash — on his property at 29 Howard Street, gathering all the requisite initial documentation. Manafort was required to list his monthly debts as part of that process; when he listed his other properties, he said he owned a home at 377 Union Street in Brooklyn "free and clear." Prosecutors said that wasn't true. Prior to the Howard Street property appraisal, James found the property listed for rent online and relayed that to her supervisor, Fallarino, but testified that she did not know what he did after that. Fallarino has not been charged with any crime. Also at trial, a vice president at Citizens Bank testified Manafort would not have received a $3.4 million loan against a condo had the bank been aware it was an investment property rather than a second residence, according to trade magazine American Banker. Separately, the trade magazine reported another Citizens worker testified she found $1 million in loans outstanding on a property in Brooklyn that Manafort had not disclosed. Citizens Bank said in a statement prior to the start of the trial that said, "We believe the evidence will clearly show that Citizens Bank did not engage in any wrongdoing and that we followed appropriate procedures." Citizens Bank's website lists Fallarino as a loan officer. His LinkedIn page describes him as a producing lending manager who got started in the mortgage banking business in 2003 as a loan officer and quickly moved up the ranks.